View complete range of curves and data sheets on the Verderair range. 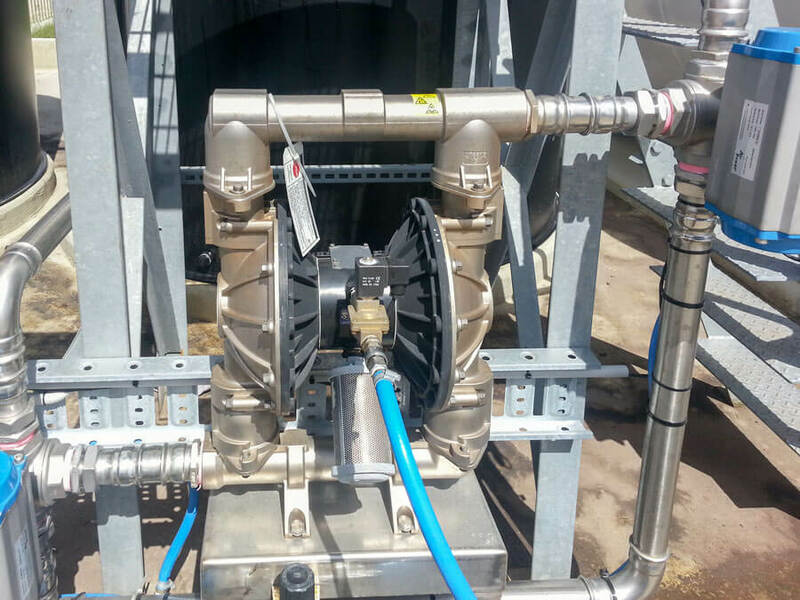 Why Air Operated Double Diaphragm pumps? Air operated diaphragm pumps or pneumatic diaphragm pumps are reciprocating pumps where the working elements are flexible diaphragms. The control is by means of compressed air being applied to the Air Valve incorporated into the pump. The air valves’ unique design guarantees a perfect, non-stalling operation, even at low pressure and does not need any lubrication. Air operated diaphragm pumps are leak free because they don’t have plungers or piston rods which pass through the pressure boundary. A leakage can only occur if the diaphragm, also referred to as the membrane, breaks. In preventive maintenance, or to avoid breakdowns, it is necessary to replace the diaphragms. The double diaphragm pump will provide variable flow and discharge pressures of up to 870 kPa by simply adjusting the air supply. The compressed air can be used to balance liquid pressure and give high discharge capability. A single air pump can provide a broad spectrum of pumping capabilities from a few litres up to 1,060 l/min. 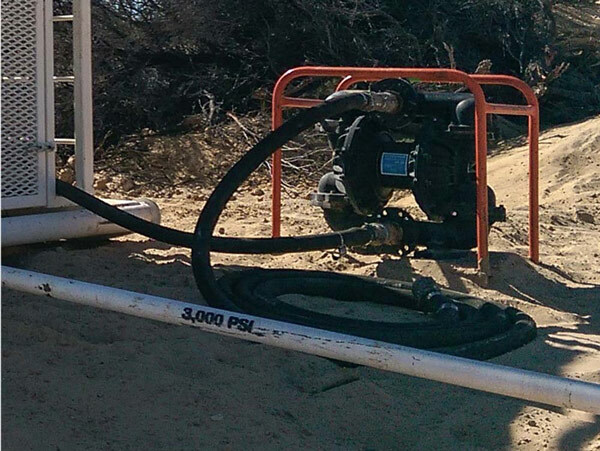 Air operated double diaphragm pumps have outstanding dry run capabilities. These pumps are designed to run dry indefinitely without damage. The AOD pumps are also self-priming from a dry start. 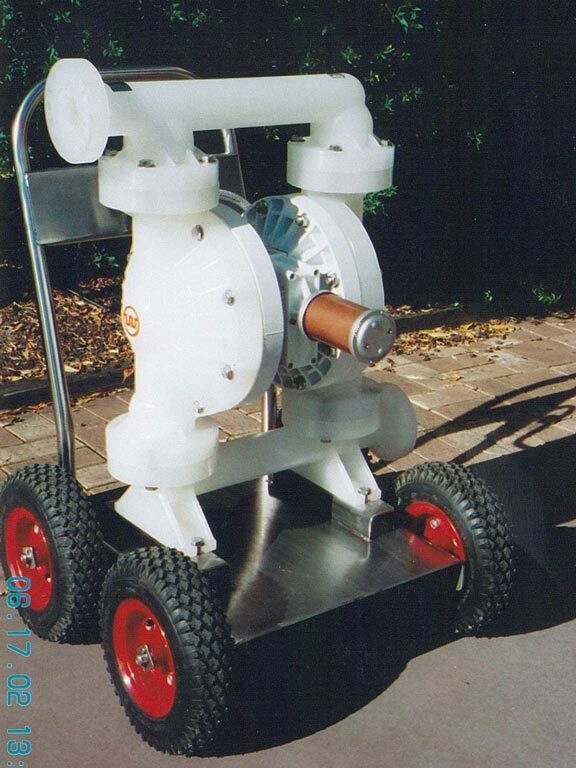 The Air Operated Double Diaphragm pump can also run completely submerged or installed with flooded suction. For ease of maintenance, they don’t require gland packing and there are no close-fitting, sliding or rotating parts to maintain. As flow and discharge of the air operated diaphragm pump or pneumatic diaphragm pump is infinitely variable (as mentioned above) one pump can be used for an extremely wide range of capabilities. This eliminates the need for costly motor drives and critical calculations. Besides the general advantages of any air operated double diaphragm pumps on the market, Verderair offers many other advantages for users. Having a wide range of proven products for different applications Verderair offers experience. Verder (diaphragm pump-set manufacturers) has over 50 years of experience with applications for the air operated diaphragm pump. This experience comes from both the industrial and sanitary segments. 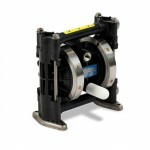 Generally, people expect Air Operated Double Diaphragm pumps to be available on a short term. Therefore Verderair works with an efficient stock-management (for both pumps and parts) and flexible production. With this, Verderair offers a real advantage if you need a pump within a short time frame. 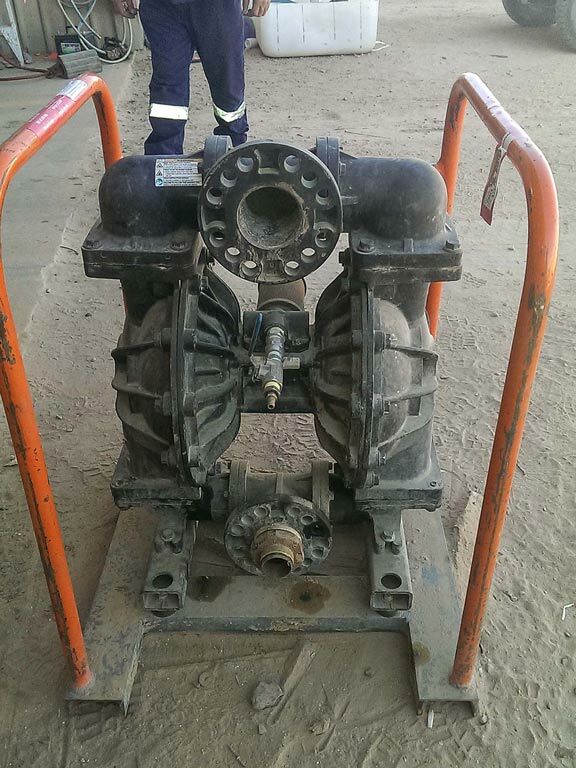 For more pumping solutions delivered Australia-wide, contact Global Pumps now. Where can these pumps be used? 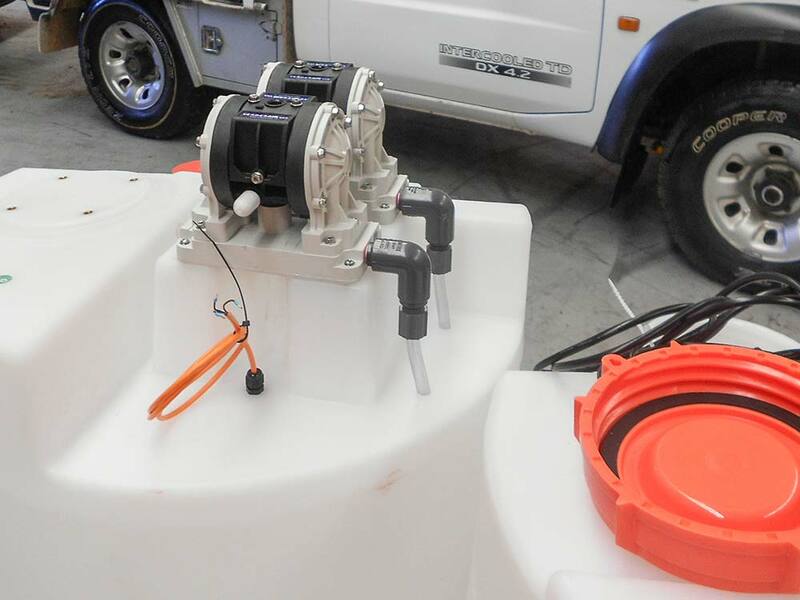 Air Operated Diaphragm Pumps can be used in a range of applications. They can be used in chemical processing and to pump Paint and other viscous liquids. There are hygienic/FDA approved versions for the food and beverage industry and are a great option for dewatering in the mining industry and can even be used to pump flammable or hazardous liquids. What are the main Features of Air Operated Diaphragm Pumps? How many sizes and materials are available? There are about seven different sizes available and come in many different materials of construction such as different types of plastics and metals. How Do I Know What Type Of Air Operated Diaphragm Pump To Buy? Fluid –The makeup of your process fluid is crucial to the choice of pump. Does it have special chemical or corrosive requirements? Is it clean or does it contain particles (slurry)? Viscosity – The viscosity of your process fluid is also important. More viscous fluids require more robust pumps to move them. Flow rate – You need to know how much liquid you need to move per unit time in order to choose both the correct size pump and the correct size of piping. Pressure – The pressure will also be a major factor, one that is intertwined with the flow rate, in choosing an appropriate pump. Refer to your pump’s “pump curve” graph to help determine the relationship between flow and pressure. Temperature – Your choice of pump necessarily need to depend on the temperature of the liquid being pumped. What Kind Of Fluid Does A Diaphragm Pump Transfer? Any kind. Examples include water, acids and lubricants. AODD pumps will handle viscous fluids as long as the viscosity has been taken into account when choosing the pump and designing the system, as some highly viscous fluids require large bore piping to be adequately pumped. 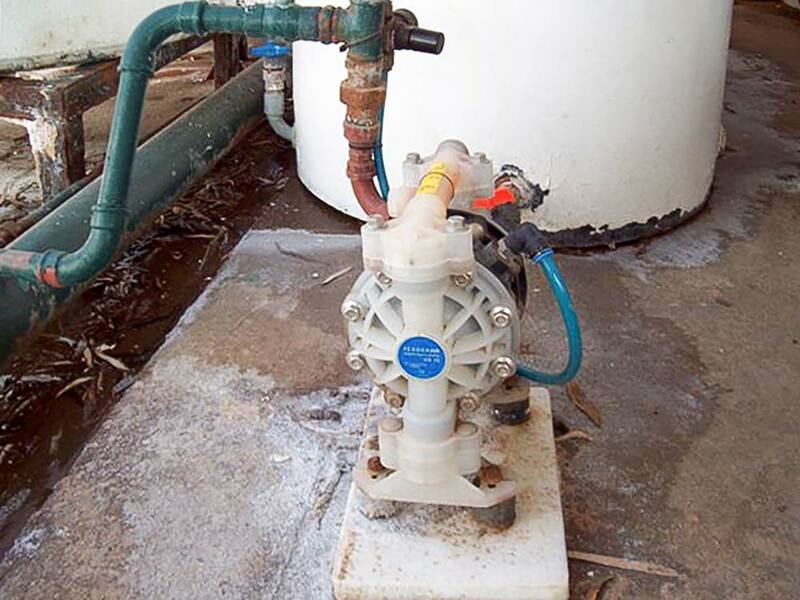 Are There Specific Considerations For Plastic Diaphragm Pumps? Because they are plastic, they can change shape slightly over time. As will be seen in the answer to the next question, plastic AODD pumps require more frequent inspection to make sure that the bolts holding the pump casing, haven’t become loose. The only other consideration for a plastic pump is to ensure that that fluid being pumped is compatible with the pump’s plastic/material. Why do air operated diaphragm pumps freeze? Although Verderair pumps are anti-freeze, we have created an article here explaining why air operated diaphragm pumps freeze. What Are The Key Factors For Diaphragm Pump Maintenance? The good news is that AODD pumps are comparatively easy to maintain. Importantly, and like every other pump, a regularly scheduled maintenance is crucial. You want to monitor things over time, to prevent mishaps before they happen. There are essentially 4 main things to keep an eye on during the life of an AODD pump. First, the quality of the air used to operate the pump. Air can come in many different qualities with various amounts of water. Impurities are removed by an in-line air-filter. Making sure that this is operating and doesn’t become clogged with debris from poor quality air is important to prevent these particles from reaching the pump and causing premature wear on the pump diaphragms. Second, examine the pump’s elastomers (diaphragms) routinely for signs of wear – replace these if necessary. Third, Make sure you frequently check the fluid inlet and outlet of your pump. If either of these becomes clogged, it can lead to premature failure of the pump. Last, especially with pumps constructed of plastic, which can change shape over time, becoming compressed, make sure that you check the torque settings of the pump’s bolts. 1/4 inch plastic. Max Flow 19 L/min. Max Pressure 7 bar. 3/8 inch plastic. Max Flow 26 L/min. Max Pressure 7 Bar.